Subtitled: Psychiatric hegemony and the manufacture of mental illness in multiple chemical sensitivity, Gulf War syndrome, myalgic encephalomyelitis and chronic fatigue syndrome. This book is essential in the understanding of the denialists campaign. Fully indexed and referenced. One day in 2006, in the company of Jim, I found myself in the Ponterdawe Inn situated off a main road north of Port Talbot. 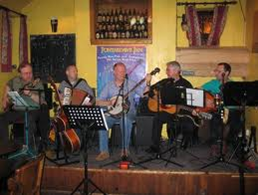 We were there to attend the Ponterdawe Acoustic Music Club, Jim as a participant and me as an observer. Jim, a life long musician, was in his element. Along with some fifteen other participants he had brought his instrument of choice, a banjo, to join in a long session of spontaneous music without rules. It took me a while to get used to the free form of the evening. In the beginning people found their own level. As the bar filled with sometimes conflicting sounds, the large room seemed like an exciting experiment; guitars, mandolins, banjos, violins, even spoons fought to be heard. As the evening wore on the individuals began to come together, playing collectively or individually pieces that they had mastered and wanted to share. It was one of the most enjoyable evenings of my life, particularly because I could sit and watch Jim concentrate on getting it right with his banjo; this in itself was a study in learning. But as well the evening brought back to me memories of the anarchy of collective learning and practice in different forms that I had witnessed during the libertarian politics of the late 1960s and early 1970s. 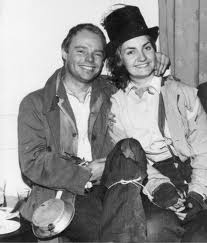 For a large part of his life, Jim with his wife Sandra, having won an episode of Opportunity Knocks — one of the original British TV talent shows hosted by the inimitable Hughie Green — toured the world playing pop and folk in unlikely places. Sandra was the singer in the band with a sharp and lilting voice. it seemed to me that he was fundamentally a musician. He spoke with real commitment about his instruments exhibited around the house, his playing and his son's talents as a guitarist. 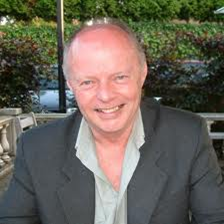 In 2005 and 2006, Jim spent his spare time assiduously transcribing the arrangements of songs and music from the guitar, which he had played since being a teenager, to the banjo, which he had only recently taken up; it being a more suitable instrument for his interest in Celtic folk songs. He played the banjo with the same self-depreciating humour with which he approached much of what he did, and with a serious scholastic concern for 'getting it right'. Jim always seemed to be full of energy; it shone from him as if he was running on batteries. At the same time, he was no one's fool, possessing that Welsh shrewdness that always made him give consideration to important questions. He was not a man of words, not a Welshman who could wax lyrical. He smiled a great deal, was often quiet, and usually happy. year of his life, however, following Sandra's death, his demeanour changed. It was as if a shadow had fallen over him. Lost in thought, he looked frequently like a man who had forgotten something important. During their marriage Jim and Sandra brought up two children, Vanessa and Chris, both of whom have turned into talented adults. Vanessa, in her early thirties, married with a son and a daughter, gained a degree at Swansea University. Chris, who Jim says, appeared uninterested in his parents' music, when he was young, picked up a guitar at twelve and very quickly taught himself to play. With single-minded practice he worked his way into music school and proved to be a virtuoso guitarist. I first met Jim in the same way that I have met a number of people over the last thirty years, when I offered my help in his legal case. In 2004 I looked at the case of a therapist in Wales who had been charged by the Medicines Control Agency (MCA, now the MHRA) after being ‘exposed’ in a BBC programme. Following up other of the ‘exposed’, I found Jim. Jim first came into contact with alternative medicine when he read about Jason Vale and his commitment to Laetrile as a curative agent in cancer. It was then that he started, as many people do these days, to research the subject of cancer on the internet. He quickly found the book World Without Cancer, by Edward G. Griffin, and, having read that, he contacted some of the people who gave testimonies on Jason Vale’s website. In 1998, Jim set up Ynoddfa Marketing to offer alternative, non-toxic remedies to support people battling serious illnesses Ynoddfa, is Welsh for 'refuge', Jim began by buying and selling apricot stones and vitamin B17. At that time he was still running the church and any ‘wages’ he received came from the church in the form of gifts. This was never enough to live on, and he and Sandra would regularly sell their possessions. It was grim, and they only just scraped by. In 2003, Jim was set up by the BBC in one of their programmes, itself a scam and a fraud. In April 2003, he received a phone call from a young woman who claimed to be acting on behalf of her partner who had cancer. In fact she was working on a short ethicless regional programme for the BBC; Week In Week Out. Following the programme, Jim's house was raided by the MHRA. Jim and Sandra both expressed the view that the MHRA 'police' had during the raid treated them like the dregs of the world, like drug dealers; the ex-cops being disrespectful and arrogant. 'They definitely wanted to frighten me’, said Jim. They even managed to insult Sandra, in the normal amoral and foul mouthed manner of the lost generations of Life on Mars style Scotland Yard detectives. Despite the raids, during which time they took all the paper work and all the stock from Jim's house and office, Jim was not charged. When I got involved in his case, both Jim and I were keen on the lawyer pushing for the return of his stock and the paper work. This in turn forced the MHRA to produce eleven criminal charges. Facing these charges, Jim's case came up at Swansea Crown Court. Although Jim didn't know it at the time, the ex-Scotland yard detectives working for the MHRA had been involved in the BBC programme which they claimed had entrapped him. Throughout Jim's court case, I stayed with him and Sandra in Port Talbot in the house that Jim had been born. The case itself was a classic MHRA operation, the prosecution distorted the evidence, were economical with the truth, and cast aspersions without evidence, painting Jim as a heartless, conniving quack. People respond differently when you ask to intervene in, observe and write about their work, especially when they are involved in a court case. Most defendants become hog-tied by their lawyers and lose touch with their lives, performing to some invisible protocol laid down by the legal system. I didn’t need to bear any of this in mind when I worked with Jim. He wanted to go on the offensive, to complain to the MHRA about the seizure of his property and its non return. He complained vociferously about the fact that the raid had temporarily ended his business but had not resulted in any hearing. Jim seemed to naturally appreciate the mutuality and co-operation which has always been one of the principles of my work. The judge in the case had decided that the jury were able to decide what was and what was not a medicine, so letting the MHRA off their statutory duty and allowing them to avoid their legal commitment to discuss and forewarn offenders about the rules on advertising. The jury decided, off the top of their heads, that some of the products Jim sold were medicines while others were not, consequently the MHRA won six of the charges while Jim won five. After the case ended, I wrote a short book about Jim and the case, titled The Fate of a Good Man. Oddly at the time, and even now, it is the non-legal matters that have stuck in my mind. On the second day of the proceedings the paper local to the court house, carried a large picture on the front page of Jim entering the building. Jim commented later: 'In another court at Swansea, at the same time as me, was a chap who robbed and assaulted another man with a gun; he never made the papers, but it seems to me that selling vitamins was a much worse offence than armed robbery and GBH; the barrister was saying that I could hang for it', he joked. Within a short time of helping with his case, Jim had laid out a web site for me and begun distributing my books. There were things which made it immediately easy to work with Jim: his patent honesty, his desire to help people and his lack of interest in enriching himself. When I stayed with Jim and Sandra helping him during the court case I saw two people with a domestically comfortable life immersed in society, friends and extended family. Still after 40 years of marriage very much in love with each other. Sandra was working three days a week for the county health authority and Jim saw his provision of health products as a constructive community service. Jim spent the last decade of his life deeply involved in the health freedom movement. He didn't just sell products, he got involved in the movement to help people and fight for freedom of choice in health care. The raids on his house and the court case shocked him and Sandra with their wilful disregard for truth and elemental fairness. Although some found Jim's involvement in a criminal court case demeaning, Jim's attitude and his own words reflected in my book, reflect the honesty of his views, not just in relation to medicine but many different areas of his life, as he says, 'My only motive was then, as it is now, to help people'. In some ways Jim was too good for this world, a lamb amongst the wolves, a thoughtful, brave and honest man who did his best throughout his life to support his family and serve his community. A good friend to many he will be sorely missed. Deborah Nash who died on Saturday 24th November was a committed parent campaigner for autistic children who had been affected by vaccine damage, a devoted mother and carer for her affected son David. I met Deb and Jeremy through my five year involvement in the case of Dr Andrew Wakefield of whom Deb was a fervent supporter. Few of us can say that we know someone; it usually takes a lifetime to even become familiar with a stranger, let alone know them. People’s lives are many layered, stretched between public and private; nowhere is this more so than with carers and even more so with those who have autistic children. Everyone has seen the soap, drama or film, where the woman, being chatted up by the man finally says, ‘There is something that I haven’t told you’, and proceeds to take a photo from her wallet, ‘I have a son’. Even in an enlightened age, a woman with a child at home is considered to be ‘burdened’. How much more so is this the case with those parents whose children have regressed into autism following vaccination. In these circumstances the great majority of the parents life is hidden by a draining domestic relationship, which most rarely talk about. With some parents whose children were vaccine damaged by MMR – yet another factor enters into the equation – that draining domestic relationship is increased with the further burden of involvement in a life-sized battle with the pharmaceutical companies. None of this makes for easy conversation or for the better ‘knowing’ of someone. These factors have also frequently given me the impression that I don’t really ‘know’ any of the parents with whom I have worked. Deborah Nash was an exception in respect of all of the above. In relation to her vaccine damaged autistic son David, she told me, an acquaintance, only what she thought I could cope with; she had humorous anecdotes for popular consumption, so as not to burden others. In relation to her struggle to right the injustice of vaccine damaged children and the fall-out from these cases, she was utterly focused. I have met few parents who were so ‘on track’ with this on-going struggle. But perhaps what was most invigorating about Deb’s approach to the problems which she and other parents faced, was her understanding that the battle against the criminal conspiracy of the government and the pharmaceutical companies had to be continued whatever the pressures on parents of ‘caring for’ their damaged children. The weight of caring born by parents of vaccine damaged children has in many cases begun to take precedent over the original cause of MMR related regressive autism and Inflammatory Bowel Disease. This is, of course, understandable: with parents facing an increasing burden as their children grow, it must be tempting for them to push into the background the original cause of their children’s condition. Because of a lifetime heart problem — just after the birth of her daughter, in 1990 Deb had a mitral valve replacement — Deb had learnt how to pace herself and her thinking, her reflections were calm but considered and however strongly she felt about something, she didn’t appear to let her emotions run away with her. Given the way in which she, her family and her son had suffered, this was a remarkable achievement. I first got to know Deb more deeply when she agreed to write a chapter for the first volume of Silenced Witnesses, published in 2008. There were finally two books which I edited and published. Each volume contained eight chapters written by parents. Deborah’s chapter in the first volume was titled ‘In the Presence of Strangers’, a comment on her son David’s desire to be alone in a quiet space. The title, however, describes much more than that, hinting at her own situation and that of Jeremy, her husband — amongst people who failed to understand. Deb was so convinced about the value of the Silenced Witnesses books that she asked her own parents to write a chapter about their generational interest in her son David for the second volume. This second chapter, Our Children’s Children gives us an insight into the reverberating generational effect of vaccine damage. Deb begins her chapter in Silenced Witnesses with the sentence: ‘For eleven years I have lived and breathed autism’. Having placed herself firmly in the community, part way through the chapter she makes clear her thinking about the importance of campaigning. ‘I felt it important to tell David’s story for the sake of all afflicted children, so that doctors and professors could have a complete picture of the damage involved and a good idea of the numbers of children affected.’ Here is one of the reasons that Deb was special, despite all the personal pain and pressures which had taken over her life, she continued to fight for others. To me these two simple statements orientate the reader in the mind of the activist and her growth from affected parent to campaigner. Deb prided herself in having recorded every interview with Dr Wakefield and clipped every article about him in the press. There was no sycophancy here, just a judicious understanding of what an activist will need to draw upon in terms of records and information. Over a period of months Deb and Jeremy copied this voluminous and important archive so that I could draw on it for my writing. Despite the growth of a community around vaccine damage and Wakefield’s case, few had tackled this important task. For the affected parent, the autism world is like any other sectional political campaigning world, unfortunately full of divisions, interests, feuds and misunderstandings. Deborah entertained few such divisive views. Those whom she defined as enemies of the cause were most decidedly the enemies of the cause, offenders against vaccine damaged, autistic children and parents alike; individuals like Brian Deer and organisations like the General Medical Council. Debs never stooped to personal insults, however, and in the last paragraph of ‘In the Presence of Strangers’, she defines those whom she feels have been responsible. Deborah Nash died on Saturday 24th November following a stroke which she suffered at 6.15pm on Friday 16th November, at home. She was operated on at Kings on Sat 17th but never regained consciousness dying a week later on the evening of Saturday November 24th. Deborah Jane Nash will be remembered, within her family as a loving and committed mother to her autistic son David and her daughter Jennifer, as a stalwart partner to Jeremy and a good daughter to her parents Derek and Iris. To those like me who knew her more superficially she was a committed and active campaigner who never lost sight of the main issues as well as a friendly, calm and understanding woman, never short of humorous aside about herself, or a biting comment about figures in the opposition. All our lives are less with her passing.